'Casa Dario' is part of Fattoria Il Castellaccio, a family owned property extended on around 800 acres of oak and chestnut woods, fields and fruit-tree gardens. The farmhouse has been recently restored reviving its ancient beauty, particularly the floor, fireplace and handbasin, all made of ancient local stone. Its hilltop location provides breathtaking views of both Arno and Tiber valleys while being in the middle of central Italy's natural and Renaissance treasures: Florence, Arezzo, Siena Perugia; Urbino, Assisi are all within a day-trip. Foreste Casentinesi National Park, 40 mins away, is considered amongst the highest biodiversity sites in Europe. Ideal choice for families looking for healthy and safe surroundings as well as for walkers, thinkers and eaters. 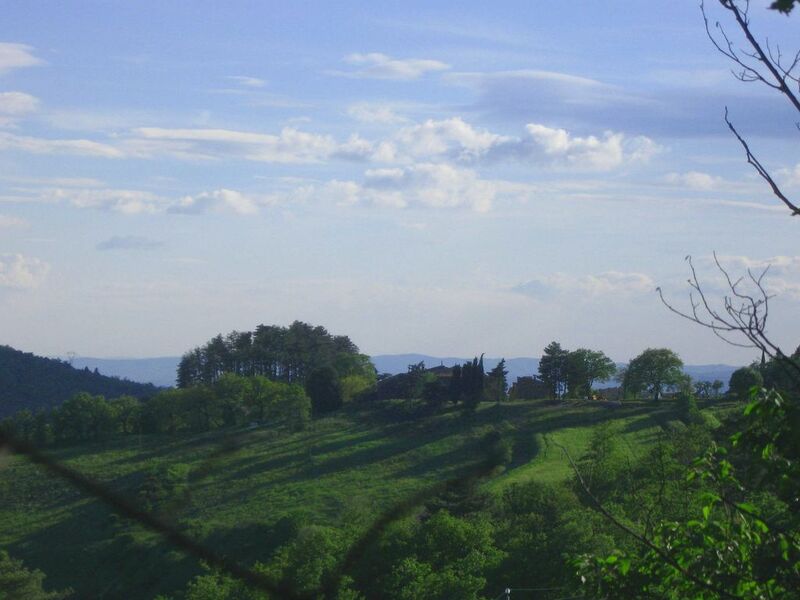 Anghiari area is one of the most traditional Tuscan gourmet destinations. Casa Dario enjoys an agreement with a nearby restaurant where good meals at special price are available for our guests. Guided tours for art and nature are available. Casa Dario is characterized as a single apartment with 2 bedrooms, very large dining-living room, 2 bathrooms. Casa Dario has two gardens, both with the splendid views of the valleys below. AREZZO COUNTRYHOUSE "Casa Dario" We spent most of our life together living in Rome and around the world thanks to our jobs in international organizations. In 2004 we decided to root our children in this unique area and, together with parents and brother, reactivated the farm, started to produce our typical gourmet products, restored some of the farmhouses and decided to share the beauty of our surroundings with selected guests. Casa Dario is part of Fattoria il Castellaccio, a property belonging to our family since 6 generations; thus, we did not choose Scille but we inherited the blessing of having available this special place. The absolute absence of mechanic sounds, especially at night, mirrors its remoteness while the farmhouse is located in an area within easy reach of some among the best spots in central Italy. At Casa Dario you can not only taste the outcome of our efforts, but also participate in the different phases of the preparations like jams, patés, smoked duck, wild boar and roe deer! Other available activities include: - Italian cooking courses.- guided excursions in the countryside (forests and meadows) for flora and fauna recognition. - guided tours in the surrounding Cities of Art. - mushrooms (mainly during autumn) and truffles (during spring, summer and autumn) collecting, and recognition hints. Large (40mq) living room (see photo): with stone ceiling and floor, cheminey in local stone, armchairs, confortable sofa-bed, wifi, games, books. There are several golf courses within easy reach of 'Casa Dario', eg near Arezzo, about 30 mins away, or Perugia, about 45 mins away. Notes on accommodation: 'Casa Dario' suits families and couples looking for a silent, nature-surrounded and centrally located shelter in Tuscan countryside. Our family house is located not far from casa Dario. Although usually we are all keeping a low profile, somebody will be available should you need any help or advice. Outside: Two private gardens equipped with table, chairs, barbecue and parasols. The farmhouse is set in acres of fig trees and cherry trees, olive grows and blackberries. Beyond this, unique views of forests descending on both sides towards the valleys. Utility Room: Washing machine, iron and ironing board, gas combi boiler, storage space. Cleaning / Towels / Linen / Maid service: Linen plus bath and pool towels provided, changed weekly. Property cleaned weekly. Extra maid service available at an additional cost. Other: Entrance, ancient local stone stairway with wooden ceiling. I loved this 500 year old farmhouse with stone floors and beamed ceilings. I had the building all to myself. Pier-Francesco, Simonetta, and Hamid were welcoming and extremely helpful hosts. I was greeted with a bottle of Chianti and a bowl of fresh-picked cherries. Each room had its own modern bathroom. Anghiari is the nearest city about 10 kms away and you can find everything you need there. It's about a two hour drive to Pisa and one to Florence or the heart of the Chianti region where I went for some challenging but soul-enriching bike rides. There are gorgeous views of the surrounding countryside from where the house sits atop a hill. It was a bit of a challenge to find (the start of the actual road up to the house looks like the driveway of a restaurant so I drove past it twice) but well worth it. Grazie for the great experience. grazie di come hai descritto il tuo soggiorno nella nostra farm house .E' stato per noi un vero piacere conoscerti e se nel tuo prossimo giro del mondo....in bicicletta passerai da queste parti ci farà molto piacere rivederti. Se invece verrai – naturalmente in auto – con la tua straordinaria famiglia, ci farà molto piacere conoscerla. Junto con mi esposo y 5 hijos, hemos pasado 3 semanas inolvidables en esta linda casa. Tiene todo lo necesario, de muy buen gusto e impecable. La ubicación es ideal para conocer la Toscana y otras regiones como la Umbria. La mitad de los dias saliamos a conocer y la otra mitad nos quedábamos en casa para disfrutar el maravilloso paisaje, los paseos por el bosque buscando venados y jabalíes, puestas de sol increíbles y por la noche gozar del cielo lleno de estrellas. Gracias Pier Francesco, Simonetta y Giacomo por ser anfitriones tan cálidos y generosos. Sobretodo, por brindarnos su amistad, lo cual hizo toda la diferencia para que fuera una estancia inolvidable. We really enjoyed our stay. The location is remote, but that is part of the charm. It is convenient to Anghiari, a wonderful walled city just 20 minutes away with some amazing restaurants. It is also a short drive to the Autostrada and is surrounded by some of the most beautiful scenery, since the property sits on a prominent hill. The farmhouse has all the modern amenities, yet is so rustic it took a day or two to get used to. But once we did, we were hooked. The owners were very nice and accomodating, and communicating with Pier Francesco was a breeze. We would definitely stay there again the next time we're in the area. ti rispondo in italiano, perchè lo parli certamente molto meglio del mio inglese. Grazie per le belle cose che hai scritto su Casa Dario. Anche a me e Simonetta ha fatto piacere conoscervi. Questa attività ci piace molto, proprio perchè ci permette di incontrare persone che vengono da tanti differenti paesi, e di apprezzarle. Sarebbe bellissimo rivedervi, e passare insieme ancora un poco di tempo. Speriamo che il vostro ritorno sia andato bene, e che abbiate ripreso la vostra vita normale più rilassati. Had a great holiday with family in this lovely farmhouse in an amazing location. Great views and setting. Local towns 20mins drive away and nice restaurant 1km walk down a country lane. Simonetta and Pier offered advice when needed and were kind, welcoming and helpful. Would highly recommend this accomdation to anyone wanting a quiet and relaxing break in the heart of the beautiful Italian countryside of this area. Farm house offered everything we needed and was full of character, comfortable and clean. Beautiful evenings spent sitting under the stars. It is now two years since we discovered this beautiful house where we spent two weeks with our friends. And we just had to come back. This time we were in the new, smaller apartment which is perfect for two people. It is fully equipped, with a large bathroom, bedroom with antique furniture, table,TV, Internet and small kitchen with everything you need. Extremely clean and decorated with great taste. It was so nice to see Pier Francesco and Simonetta again to share moments together. They are generous, charming hosts. It is a miracle to find such a place which is so peaceful and quiet. This summer was very, very hot but there was nice, refreshing wind in the evenings. Why is this place so special? Because you can enjoy in this idyllic, peaceful house and visiting the most beautiful towns in Tuscany at the same time-because they are so close. You'll never forget. thank you again for this piece of paradise, for your kidness and excellent house products. We can't wait to see you again! We spent a week in this idyllic and beautiful house. The pictures can't prepare you for the beauty of the land. The house is nestled on the mountain in the heart of Tuscany. It's remote, but only twenty minutes from historic and beautiful towns of Arezzo, Anghiari, and Sansepolcro. The house is a piece if history, but has been renovated to meet the needs of modern families. The house is very clean, spacious for a family of 5, and has a great deal of character. The land surrounding the home is nothing short of stunning. We walked around grounds, enjoyed the fresh mountain air, and picked figs and plums straight from the trees. The hosts (Pier and Simonetta) are extremely kind and accommodating. They are always there to help but respect your privacy. We can honestly say that we've made lifelong friends with them! Our biggest regret is that we didn't stay longer! Special location for combining nature and arts with good food and wines. Being immersed in a farm specialised in typical food products, it is possible to arrange activities related to harvesting and elaborating our gourmet specialities. Cooking and pasta-making lessons available on request at additional cost. Guided tours of the surrounding natural treasures as well as for the Cities of Art are available. Both coasts are reachable within two hours. Lake Trasimeno in one hour. Lake Montedoglio is 30 minutes away. Use of a car is pretty much essential, although there is public transport (trains to Arezzo, buses to Anghiari and La Scheggia). Suitable airports include: Perugia - 1 hour; Florence - 1.5 hours, Rimini, Ancona & Bologna - all around 2 hours, Pisa - 2½ hours; Rome - 2.5 hours and Venice - 3.5 hours. Anghiari 10km. Sansepolcro 16km. Arezzo 18km. Florence 90km. Siena 70km. Perugia 70km. Assisi 80km. Urbino 80km. Rimini 100km. Pisa 150km. San Marino 90km. Rome 220km (highway). Anghiari (officially one of the nicest medieval towns in Italy) has a small supermarket, pharmacy, doctor’s surgery, post office, some good restaurants (two of them fantastic), bars, pizzeria, police station, bank. Sansepolcro has a much wider selection of supermarkets and shops. A very good local restaurants are located within 10 minutes walk (2 mins drive) from the house. Several local markets can be found in local towns, our favourite being Anghiari on Wednesday mornings. Notes on prices: An additional room with bathroom is available, on the same floor, close to this two-rooms and living room apartment. If required, it can be rented jointly with the main apartment at an additional price of 20%. Booking Notes: Contact owner via email or telephone for pricing and availability. Changeover Day: Saturday to Saturday. Arrival after 4pm. Departure by 12pm. Flexibility may be considered in special cases (eg night flight arrival).